Migrating Positions – WELCOME TO OUR INTERNATIONAL SUPPORT! So many programmers use a static clock where the same category plays at the same time in the hour. Wouldn’t it be great if you could vary it up while still maintaining control, adding an element of spontaneity to your station’s sound? The answer to this question is to use Migrating Clock Elements. Instead of using a Fixed element type, schedule a Migrating position, then check both your Heavy and Light categories. Once you click OK your clock screen will open a second window called FlexRules. We’ll get to the FlexRules in just a moment. Now create the other two migrating current clock positions at the appropriate points in your clock. Now let’s look at the FlexRules. At this point you will see that there are three migrating positions in the clock calling for Heavy and Light currents. Here we can set the Minimum or Maximum of each of these in the hour or sweep, indicate minimum separation (in positions) between plays of the same category, as well as which categories are not allowed to segue with the migrating positions. For this first example, we only need to establish Min/Max per Hour. We’ll set it for minimums of two Heavy and one Light as well as maximums of two Heavy and one Light for this hour. By doing so, we’re telling MusicMaster that we want two Heavy Currents in the hour and one Light Current per hour (amongst migrating positions only). 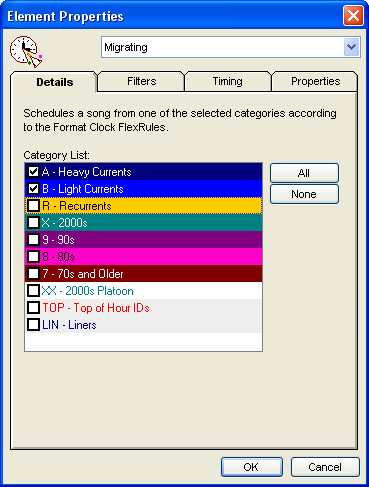 Now when we assign this clock to the active grid and launch the Automatic Scheduler, MusicMaster will follow those FlexRules and effectively randomize which of the three migrating positions in the hour will contain the light current as opposed to heavy current. Let’s take this a step further. We want to randomize where any of our music lands within the hour. We know we need 14 music positions in the hour. So start by creating 14 migrating positions, each calling for all of your active music categories. Next, set up the flex rules as needed. In the above example we have 14 migrating positions, all of which call for categories ABRX987. We’ve set Minimums and Maximums per hour. Notice that our minimum total is 10. The total minimum cannot exceed the number of migrating positions in the hour. If your minimum total is greater than the number of migrating positions in the hour, that number will appear in red. Notice that our maximum total is 17. The total maximum cannot be less than the number of migrating positions in the hour. If the maximum total is less than the number of migrating positions in the hour, the number will appear in red. We’ve also set up Max/Sweep settings. This will only work if you are using Sweep Markers on your lognotes. We’re telling MusicMaster to not allow more than one Heavy Current or 90s to occur between any two sweep markers. We’re also requesting no more than two Recurrents or 2000s occur between any two sweep markers. We’re requesting five positions between plays of Heavy Currents, four positions between 80s songs, and at least one position between songs from Recurrents, 2000s, 90s, and 80s. We’ve also requested that MusicMaster not play Heavy Currents next to Light Currents. 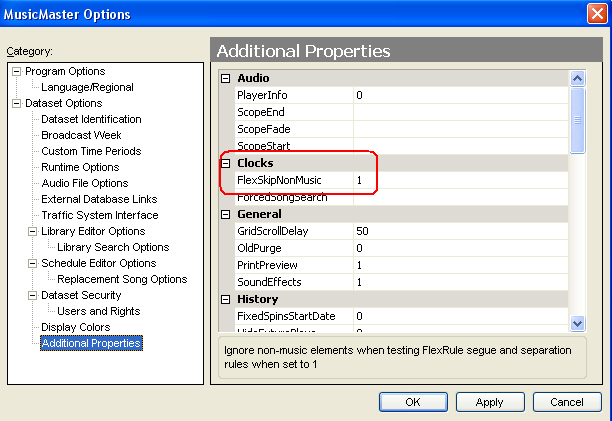 NOTE: If you are using Non-Music categories in MusicMaster, you’ll likely want to go to Tools/Options/Additional Properties, and under the Clocks header change FlexSkipNonMusic to 1. Otherwise your non-music categories could interrupt the separation and segue protection set up in FlexRules. You can use Migrating positions in combination with other element types in your clocks, just remember that the FlexRules are only dictating what happens with those Migrating positions. You can have some positions migrate among one set of categories and other positions migrate among other categories, the positions don’t have to be consistent. For instance instead of calling for every category in every position, you might dedicate some positions for your currents and some for your gold categories. You’ll still have a randomizing effect, but you will have consistency in where the currents or golds play within the hour. The possibilities are endless. NOTE: Should you have an unscheduled migrating position in your schedule editor, replacing that position will not abide by the FlexRules as the replacement window (F9) only tests rules present in the Rule Tree. Try out migrating positions and add some spontaneity to your sound!